No one is purely bad, and everyone carries their own pain which influences the decisions they make. This doesn’t condone their thoughtless, insensitive, or selfish decisions, but it makes them easier to understand. After all, we’ve all been thoughtless, insensitive, and selfish at times. Usually, we have good intentions. And for the most part, we all do the best we can from day to day—even when we hurt someone; even when we’re too stubborn, ashamed, or in denial to admit the hurt we’ve caused. So how do you forgive someone when every fiber of your being resists? How do you look at them lovingly when you still have the memory of their unloving action? How do let go of the way you wish things had worked out if only they made a different choice? 1. I remember them as a child and it’s much easier! 2. I remind myself that I forgive not for them but for me and that it’s easier to forgive than to hang on to so much anger, hurt and betrayal. 3. I just acknowledge that we are humans, so we are allowed to make mistakes. 4. Remind yourself that they are not separate from you; they only appear that way. Then you will realize you are one, and it is yourself you are forgiving. 5. Do not keep thinking of the past or the bad thing that happened; when you let go of it, you get over the anger/bitterness that you felt and it clears the path of forgiveness! The best thing is time! 6. Remember that we are all doing the best we can at the time. 7. 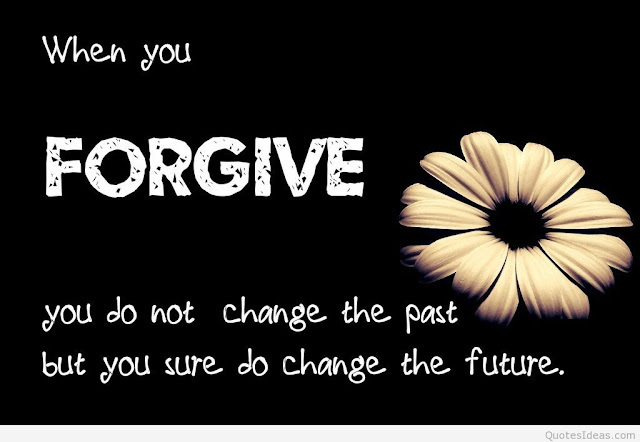 Remind yourself of how much forgiveness would mean to you if it was your turn for a mistake! 8. Wayne Dwyer describes how hate is love which has been turned around. Seeing the expression of what can’t be forgiven as love makes it easier to forgive. Were also all doing the best we can, according to our own evolutionary state, including those we find hard to forgive. 9. Because it takes less energy to love and forgive than it does to stay angry and hold a grudge.It brings peace to your life. 10. I know that I need to forgive someone, not for their benefit, but for my own peace of mind.Don’t do it for them, do it for you! 11. You remember why you love them. Love is about forgiveness. 12. Forgiveness comes easier with the passing of time. I tend to find that, if I am wronged, I forgive the person before they forgive themselves, and when I am in need of forgiveness, it is I who feels the guilt for longer. 13. Stop thinking and just do it. Open your heart and forgive. 14. Don’t force it. If I don’t feel forgiving, I can at least not act on my anger. Eventually forgiveness will come if you welcome it. 15. Just learn to smile and let things go. 16. Give up on all hope of a better past. 17. Every time you think of them send them love. After a while it gets easy. 18. Meditate, meditate and meditate some more until it’s gone! 19. The harder it is to forgive someone else, the more I am responsible. When I understand and forgive myself, forgiving others is easy. 20. Two different approaches. One involves restoring your boundaries and sense of protection first. The other involves focusing on what your body is feeling and stop dwelling on the offense. Both involve being present. 21. Forgiveness comes easy when you know that what people say or do is about them, it’s not about you. 22. Shift the focus, feel the pain and think of the thousands of others in the world who are also feeling the same pain, then send a loving-kindness message to everyone to be relieved of this suffering. 23. When it happens I often ask myself “What strengths must I develop further from this?” Often the feeling of resentment just goes away, slowly but surely, because I wasn’t focusing on the person that wronged me, but the lesson that the event was trying to tell me. 24. I allow myself to feel again whatever I didn’t express “in the moment” when I was with them.Forgiveness always seem to follow those (usually) difficult emotions. 25. Write a brutally honest, emotionally raw letter telling them how much they have hurt and angered you, then tear it up and burn it. As you watch the smoke rise, think about the fact that you are not that hurt and that anger. It is fleeting, just like everything else. As the smoke carrying your hurt and disappointment disappears into the air, you can let it go. 26. For some wrongs, I just have to remember that they are responsible for their actions and then it is easier for me to just let it be. 27. By remembering that it will free me from the burden of the stress I feel, also, if I can’t forgive then how can I expect to ever be forgiven? 28. Just look to the future instead of focusing on what’s past…think of creating new good memories to wipe away old bad ones. 29. It becomes easy when you remember a time when you were forgiven, centering on how it made you feel. 30. Understand this: whether you like it or not, over time, you will stop feeling the pain, so why hold on to something that’s going to away anyway?